Question: Why did you decide to restart this website in 2012? It was rather random in that I had felt a resurgence of interest in doing it again. Like anything else in life, you have things that interest you and after a while you grow a part from it and other priorities in life take over. And in some cases, you come back to it. To put this into context, I've had Lao Connection since 1998. That's a long time. Even though I had given it a break for a few years, I had always maintained and kept the domain name but had left the original site as it was so that if people still wanted to refer to it, that it would still be there. So I never gave it up completely. My sister once accurately commented to me that out of all of my interests that I always came back to Lao related stuff and she was right. 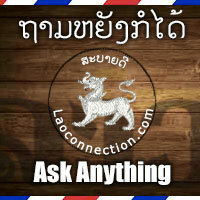 For me the site is my outlet for creativity and to share posts on Lao related stuff. More importantly, I always felt it was a great opportunity to educate others about our culture and what's going in Laos and Lao communities around the world. So with that in mind, I began preparing for the reboot of the new Laoconnection.com, this time in its new blog format. I re-introduced it to the world in April 2012, via the interweb, of that year to coincide with Lao New Year. The rest is history. It's hard to believe that it's been five years since the reboot.